This has been reposted here as the website Aldborough.org seems to have gone. 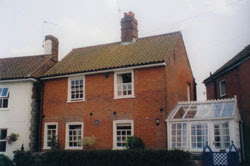 Aldborough is a traditional English village with attractive cottages clustered around the village green, where in summer you can enjoy watching a game of cricket. An ideal location for a relaxing break but also excellent for a family holiday with the seaside towns of Cromer and Sheringham within eight miles. This is a good area for walking and cycling with The Weavers Way footpath running through the village. The fine city of Norwich and the renowned Norfolk Broads are both within easy driving distance as well. The village has a shop, post office and two pubs/restaurants. 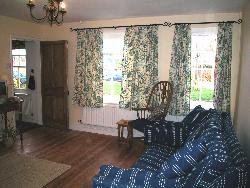 Ground Floor: Sitting Room attractively furnished with comfortable seating, colour TV, video, CD hi-fi and woodburner. 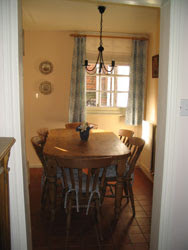 Dining Room with dining table and chairs. Kitchen with gas cooker, fridge and microwave. 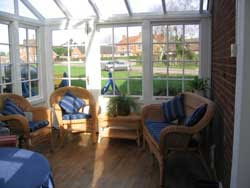 Utility Room/Cloakroom with washing machine, tumble dryer, washbasin and w.c. Conservatory with cane furniture. First Floor: Bedroom 1 with 1 double bed. 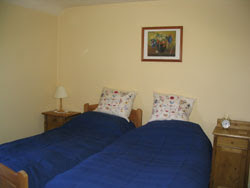 Bedroom 2 with 2 single beds and bunk beds. Bathroom with bath, over bath shower, washbasin and w.c. Shower Room with shower, washbasin and w.c.
Garden: Fully enclosed small patio garden with garden furniture and barbecue. Parking: On village green, opposite the property. 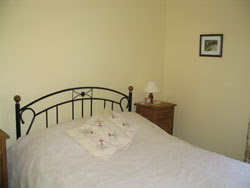 Included in Price: Bed linen and duvets provided. Electricity and central heating included. Also Provided: Highchair. Books, games and children's videos. Welcome pack. Extras: Towels available for hire at £3 per person per week. Pets: One well behaved pet welcome. Notes: No smoking in the cottage. Weekly bookings start Saturday. Prices vary for time of year and length of stay. For bookings please call Martyn on the above contact number or email us with dates and length of stay and we will get back to you. We look forward to hearing from you.